Let's be real: the royal family's genes are strong. We've seen just how much Prince George takes after his father, Prince William, and discovered that Princess Charlotte is practically the queen's spitting image — but when it comes to the family's latest addition, Prince Louis, we can't help but notice how much he takes after his mom — and a newly resurfaced photo of Kate Middleton as a baby pretty much proves it. In new official portraits taken to commemorate Prince Charles's 70th birthday, the heir poses with wife Camilla, his sons, William and Harry, and their respective wives, Kate Middleton and Meghan Markle. 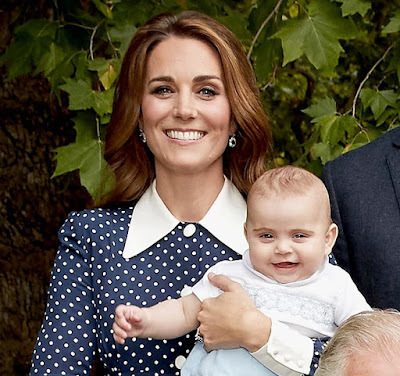 Also adding an adorable touch to the photos are Charles's grandchildren; George, Charlotte, and Louis all make cute appearances, but it's 7-month-old Louis who nearly steals the show. Louis, who stayed cozy in Kate's arms for the shots, appears to have inherited her sparkly hazel-green eyes, thick eyebrows, and wide smile. And once you see his sweet face side by side with Kate's as a baby, you'll notice their resemblance even more. We've only gotten a handful of glimpses of the latest baby Cambridge — once hours after his birth, in sweet portraits with his older sister, and again as he slept through his own christening— so getting to see him again was a real treat. It will be interesting to see if Louis continues to take after Kate as he gets older, right? Scroll through to see how much Kate and Louis look alike as babies.